Just for the hell of it, check out Gary Owen handling a heckler after the jump. Note: This post will remain on the top of page 1 all day in remembrance of Michael Jackson. Scroll down throughout the day for the latest posts. Michael Jackson had a pretty one-sided relationship with comedians, he provided them with tons of material and they… gladly accepted it. It wasn’t all negative though, and a ton of it was hilarious. In memory of the King of Pop, we’ve compiled a few (non-negative) videos of impressions, stories, and jokes about Mike, that he may have even chuckled at. Check out more after the break. "It's feeling like the 90s all over again, man!" Have you been complaining that there are not enough black people on television, outside of the stellar reality programming VH1 provides? Well you’re in luck! Marty-Mar and Academy Award winner (still laughing) Jamie Foxx have several projects in development with a few stations. Foxx has reunited with his old In Living Color producers for an yet-to-be titled sketch comedy program on MTV. No word on who’s been tapped to star in the show, but this is definitely something to be excited for… as long as it doesn’t knock and of MTV’s Diddy programming off the air. 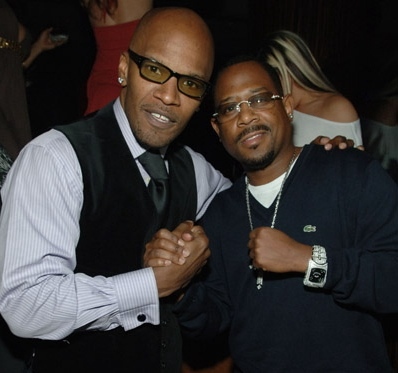 Not to be outdone, this time at least, Martin Lawrence has three projects with his name on it in development. The first is a return to Fox network with an animated series, focusing on Lawrence’s childhood in DC. He is also shopping a comedy based on a funeral home that has yet to find a home anywhere. His most exciting project, in my opinion, is a Gary Owen sitcom on Starz, which the station has left in the hands of Lawrence to develop. The show would center around the life of Owen and his interracial household. With Martin Lawrence and Gary Owen involved, I have very little doubt about how awesome this project is going to be. Update: We see you Gary!